Lasserrade is a tiny village in the Gers (South-West France) with fewer than 200 inhabitants. 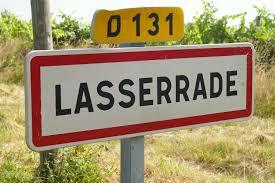 Depending on the direction of approach, signposts refer to it indifferently as "Lasserade" or "Lasserrade". Happily, the Post Office is equally indifferent. Scottish psychologist Alan Kennedy founded Lasserrade Press in 2009. His sixth novel, The Things that are Lost, was published in December 2018. Oscar & Lucy, described as an "autobiographical biography" of the psychologist Oscar Oeser, is also published by Lasserrade Press.